The latest trailer for The Hunger Games has hit the scene, and it provides a stark reminder that the Super Bowl would be 100% more interesting if the game involved Lenny Kravitz, Donald Sutherland, and archery. 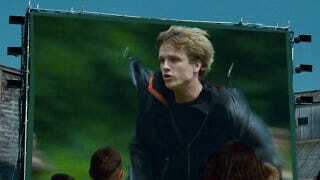 Most importantly, we catch a glimpse of Katniss evading death during the Games. Looking good, Stanley Tucci!